I'm going through a phase of Alaska withdrawal. It's been a few years since I've cast a fly in one of her waters. I need to go back. The above fish photo is of a pink salmon caught while on a float trip down the Talachulitna River (remember this one Larry?). 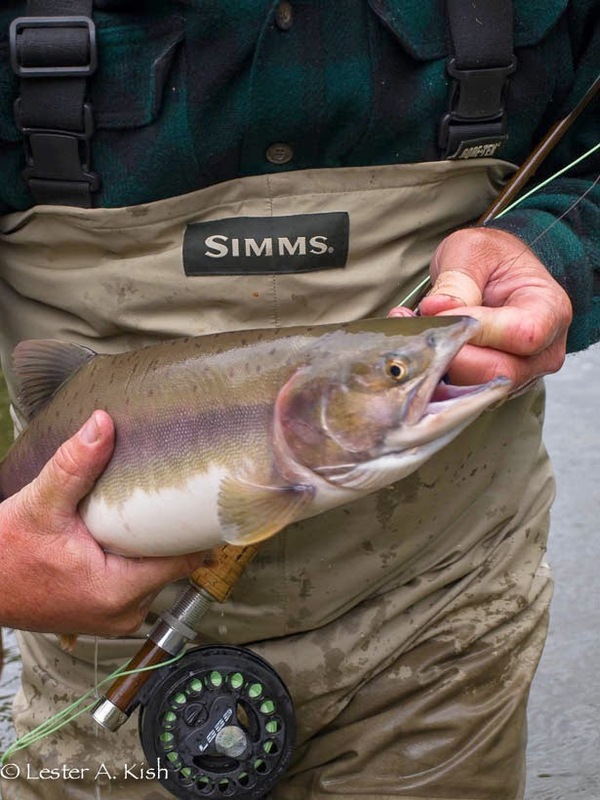 No, it's not an ad for Simms or Loop, although they do make good stuff. Pink salmon are another underrated fish. Where else but in Alaska could you catch a bunch of four to six pound fish and be disappointed. Heck, guides floating the Madison would wet their pants if they could get their clients into a boatload of four to six pounders. Pinks have the shortest life cycle of Pacific salmon, completing it in two years. Interestingly, unlike other anadromous salmonids which may spend up to a year or two in fresh water before smolting, pink salmon fry make a run for the ocean soon after hatching. Also, even numbered years tend to see huge runs of returning fish, while odd numbered years will show few returnees. 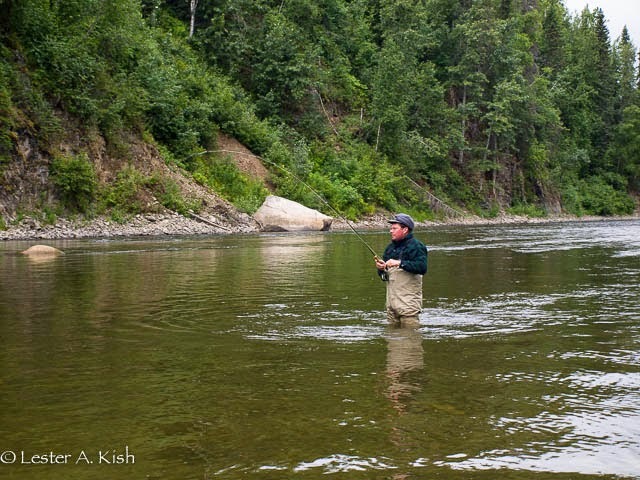 More info about pink salmon life history can be found at the Alaska Fish and Game website here. They are fished for commercially. In fact most of the canned salmon found in grocery stores are pink salmon from Alaska (see Seafood Health Facts). As for the fishing, it's not complicated. Got a six or eight weight fly rod? Fine. Add a piece of leader. 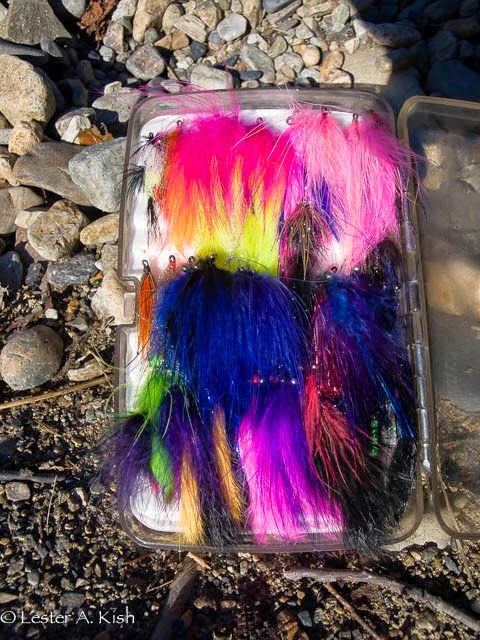 Attach a nice colorful fly. Marabou is good (remember Phyllis Diller?). Go get 'em. Also known as humpback salmon or humpies, they have a namesake bar in Anchorage (see Humpy's Alehouse). If you're in Alaska, make sure to stop in. They offer great food and an impressive selection of micro brews. Heck, any establishment named after a fish has to be good, right? 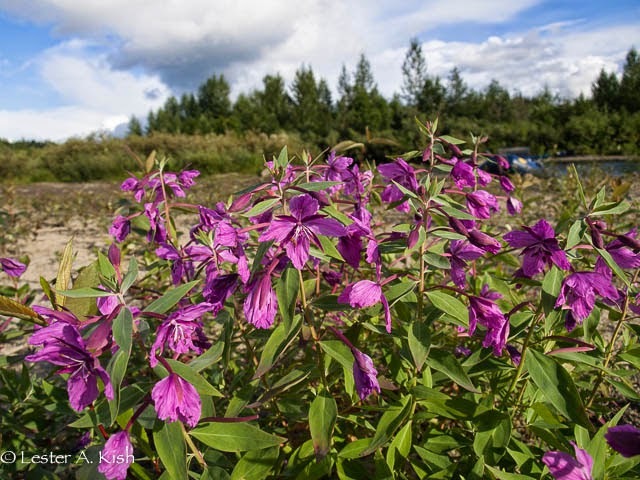 I'd sure love to try for pinks in Alaska, but I fear I'll never make it there. Montana is more realistic for the likes of a bum like me. Hey, that's where you live! Lucky bum. Anything is possible Walt. There was an old fellow by the name of Norman Vaughn (sp?) who's saying was "Dream big and dare to fail". Rat hole away a few shekels, save up some air miles, get a few buds, and get dumped on a remote river by an air service. Go nuts, you'll never regret it. I'm looking forward to my next trip too! As I mentioned to Walt, you should go too. You owe it to your fly rod.